Christchurch was built by the Diocesan Architect Richard Phipson at a time when he was engaged in his two greatest works, the restoration of St Peter Mancroft in Norwich, and the complete rebuilding of St Mary le Tower in Ipswich. The construction of this simple Gothic church must have seemed like light relief. Whittington is a suburb of the industrial village of Stoke Ferry, and the increasing population here in the second half of the Victorian period suggested the need for a new church, as it did in the centre of Stoke Ferry itself. The dedication stone on the south side records that it was Dedicated to the Glory of God and in memory of the Rev Charles Manners R Norman MA by his devoted widow Caroline Norman AD 1874. This meant that it arrived on the scene rather later than the Stoke Ferry church. 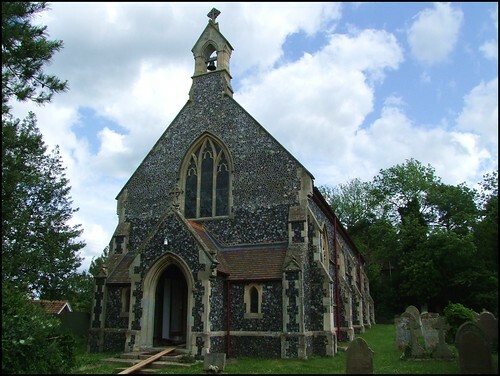 However, All Saints Stoke Ferry is now closed, while this one is still open. All things are relative, of course, and the word 'open' applied to Christ Church is perhaps not entirely appropriate, because I have never met anyone who has been able to walk inside this church unless it was for one of the minister's services. And, ironically as it would turn out, we found Christ Church graveyard cordoned off for dangerous rebuilding work, with warning notices about safety. But being rather old-fashioned and a stout-hearted Englishman to boot, I scorned this anti-litigious approach to safety, and I squeezed through the security fence to find the west doors open. The interior of the church was full of scaffolding, the walls and tracery run of the mill. Nothing fell on me, nothing leapt out and wrestled me to the ground. I won't be suing anybody. I wouldn't have done so anyway. But I was glad that I had seen it.